If you are like me, you see the word "bacon" in a recipe title and you have to read more. Add pasta and I'm even more excited. I was browsing through recipes pinned to Pinterest when I first came across this one for Bacon and Asparagus Pasta. Turns out it comes from a blog of someone I "know" from a cooking board I belong to, and that blog is one you should definitely check out - Tide and Thyme. Her recipes are fabulous and her pictures are always mouth watering. I put this recipe on our meal plan for a weeknight. When I started to prep I realized that it called for making a separate alfredo sauce, something I wasn't prepared for as I usually make my sauce right in the pan where I cook my bacon, veggies, etc. I still went ahead with the recipe though as I had been craving it all day. Making the separate sauce really only added 10 minutes to my time spent at the stove, and what's one more pot to wash for a fabulous meal? Alternatively, you could make the sauce ahead of time and heat it when you are ready to cook (heat slowly and constantly stir, and you may need to thin it out a bit with a touch of cream). I made very minor changes, including only adding in half of the bacon and using the other half to top our pasta - I love that crunch of the bacon. I also added some thinly sliced onions and used light cream instead of heavy cream for the sauce. This pasta was so creamy and rich, and the smoke from the bacon was the perfect addition to the creamy and comforting alfredo sauce. You could add any other veggies you like - broccoli and red peppers would be a great combination. The sauce: Melt the butter in a large saucepan over medium-high heat. Slowly whisk in the light cream. Cook, over medium heat until simmering. Combine the flour/cornstarch and cold water, whisk into the cream mixture. Cook, whisking constantly, until sauce thickens. Remove from the heat and whisk in the Parmesan cheese (doing this off the heat will keep the sauce from getting chalky). Season to taste with salt, if needed. Cook pasta according to package directions. Reserve 1/2 cup of pasta water before draining. Return the pasta to the pan that you cooked it in, and set aside. Heat a large frying pan over medium heat. Cook the bacon until browned and crispy, about 5 minutes. Remove and place on paper towel lined plate to drain. Remove all but 2 Tbsp of grease from the pan, and return to the stove. Add the chopped asparagus to the pan, stirring occasionally. Cook until tender, about 7 minutes. About halfway through cooking the asparagus, add the onions. Add the garlic, and cook for 1 minute more. In the meantime, cook your pasta in a large pot of boiling, salted water. Drain and set aside, keeping 1 cup of the pasta water. 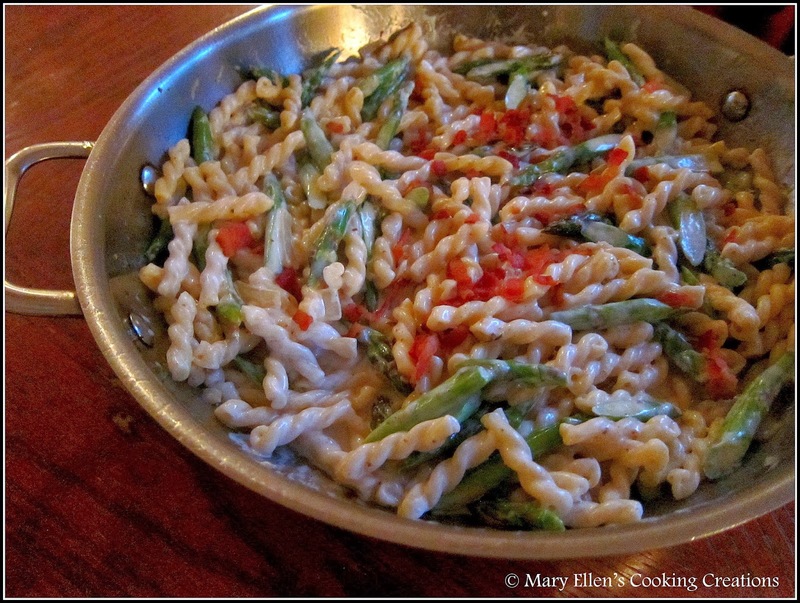 Add the pasta to the pan with the asparagus, and add in half of the bacon and slowly add the sauce. Toss to combine. If sauce is too thick, add a bit of the pasta water to thin it out. Season to taste with salt and pepper before serving and top with more bacon.